601 Union Street, Suite 4200 | Seattle, WA 98101 | 360-805-3131 . ATTA email communications, click here. From Northern Africa to East Africa, our countdown features some of the most exotic spots which everyone should have on their must-visit list. Africa is blessed with a diverse terrain, incredible weather and some of the most ancient artifacts in history. It is for these exact reasons that it makes for a great vacation spot. But where exactly are the best places in Africa one can go to get the most of everything and experience some of the most breath-taking sights and sounds in the world? Sphinx, Egypt: This monument which is the body of a lion with a human head is 70 meters long and 20 meters high, that is as tall as a six-story apartment block. It's also 9,000 years old and an absolute must-see for everyone. Mount Mulanje, Malawi: This is the highest mountain (about 3,000 metres) in central Africa and would make for a great hiking spot. Riding safari, Kenya: Ever wondered what it would be like to be in the jungle? You can experience this by riding on the back of a horse and ride alongside zebras in the Masai Mara. The Southern Cross, Zambia: As the Northern Light is to Nordic Europe, so is this iconic formation in the night sky which is best seen from the Southern Hemisphere - including a vantage point on an open-air safari in Luangwa, Zambia. Flamingos, Kenya: Enjoy the sight of a million resident flamingos at Kenya's Lake Nakuru National Park. Lower Zambezi, Zambia: Remember singing about the River Zambezi in primary school? Canoing safaris in the Lower Zambezi offer sightings of hippos, elephants and other animals drinking from the rivers and tributaries around camp. Kilimanjaro, Tanzania: If this spot isn't already on your travel list, by all means feel free to include it. Standing at at 5,895, this is Africa's highest peak. Lake Malawi, Malawi: This is one of the largest lakes in the world and boasts 1,300 species of tropical fish - which is more tropical fish than any lake in the world. In the 21st century, what was confined to science fiction movies is now becoming reality, especially in the travel industry. Robots are making their way into the tourism industry, but traditional travel related aspects such as exotic destinations and authentic local food will continue to remain important in 2015. A marked trend observed in 2015 is an increase in reservations to upcoming destinations like Africa and Asia. As more and more people are able to afford travel to foreign destinations, those that have been regularly traveling are looking forward to having spectacular experiences. Further, travel conditions are improving by leaps and bounds, leading to opening up of newer destinations in countries around the world. This in turn is significantly widening the scope for a wide range of travel experiences. At the top position in the list of most interesting travel destinations in 2015 is Okinawa, referred to as Hawaii of Japan. Further, introduction of technology into the industry is impacting tourists in a great way. A key development in the recent times is what is termed as braggies, which are selfies that people make use of to brag about places they have visited. Travelers are also increasingly focusing their attention on future. For instance, they are widely utilizing a technology by name Botlr. These robots were initially used in airports. However, they are now being used in hotels with a view to automate some of the processes that customers have always found to be very annoying. This has made it possible to automatically make hotel and airline reservations. Another trend that is being observed in 2015 is the increased interest of travelers in meeting with the locals and understanding their true culture. WTW Global Tendencies Report shows that websites like bookalokal.com and Eatwith.com are rapidly expanding their operations. While the former is created by a network of locals in many destinations to provide lessons in cooking and meal preparation, the latter site links travelers and home cooks. Airbnb has influenced these websites in a strong manner. Guests research the hosts and then rate them on the basis of a combination of factors such as locale, meals and cleanliness. It is predicted that many websites like these will see a spurt in growth in the near future. Savvy travelers of the 21st century are attaching a great deal of importance to connecting with local people and having authentic experiences. This is because travelers want to have a true experience and appreciation of the country being visited by them. In fact, the average tourist, particularly those belonging to the millennial niche, does not want to feel as though he/she is a tourist. It is actually difficult to clearly define the millennials, but typically they belong to the age group 18 to 34 years. This means that the 2 billion travelers around the world belonging to the millennials category are driven by their desire to experience the lifestyles in other countries. At least, this is what has been revealed by the Tourism and Travel Trend Report for 2015. A GAME DRIVE IN THE ZAMBEZI NATIONAL PARK, OVERNIGHT IN A MOBILE BUSH CAMP AND FULL DAY CANOEING ON THE ZAMBEZI FOR THOSE WITH A TASTE FOR NOSTALGIA AND A YEARNING FOR A TRUE AFRICAN ADVENTURE. Shearwater began life 31 years ago as Zambezi Canoeing Company and embraced the motto of "The Pioneering Spirit". A thirst for the finest overnight Canoe and Safari experience has drawn us to the newly launched �Explorer Style Mobile Camps� operated by Wild Frontiers above the Victoria Falls. The flexible bush camps allow you to be in the depth of the wilderness and still enjoy the necessities you do not want to miss; cotton sheets, steaming hot bush showers with eco-friendly toilets, ice cold drinks and excellent home cooked food served under the beautiful African skies. Spend a night in an authentic safari camp on the banks of the Zambezi River and then after the riotous dawn chorus - follow David Livingstone's paddle strokes down the Zambezi River to within sight of the Victoria Falls. The total cost of US$285 per person includes one night�s accommodation, two activities, dinner, breakfast, lunch and local beverages. Should you prefer luxury to comfort you have an option to upgrade to the Pioneers Luxury Camp, a permanent almost "retro" luxury bush river camp with large spacious tents and ensuite bathroom facilities for a total cost of US$370 per person. Downstream, the river raced swiftly out of sight and another huge rapid thundered a warning to our vulnerable rafts. Wisps of spray sparkled with the colors of the rainbow where the river disappeared and a menacing crocodile charged our rafts from the far bank. Sanctuary was a small eddy on the south bank of the river where hippos jumped on top of each other wary of the strange intruders. I shivered at the idea of running a rapid we had never seen, didn't fancy the idea of facing a crocodile longer than our raft and so opted to upset the hippos. A large bull rose out of the water, opened his huge mouth in warning and then crashed into the pool and disappeared. Seconds later, I pulled hard on the oars and spun the heavily laden raft into the eddy hoping he would not surface beneath me. We hit the bank, tied off the raft and watched the croc hold his ground behind a little rock island mid-stream. No-one had ever rafted these rapids before. More than four thousand miles in length, the mighty Nile is the longest river on earth. The great waterway has played a monumental role in history. It traverses an incredible variety of landscapes, a colorful medley of cultures and since the beginning of time has enthralled civilizations with its power and mystery. Ancient Egyptian kings sent armies in search of the source of the great river and explorers from Herodotus to Speke have sought to chart its course. Until very recently no one dared challenge the White Nile at its source &endash; some of the most powerful and sustained rapids on earth. Adrift made an historic first descent of the Victoria Nile (the first section of the White Nile) in July 1996. BBC news featured this incredible 10-day descent at prime time viewing. Both the Royal Geographic Society and the National Geographic Society have recognized this as one of the most challenging river descents ever. The 80 km section of river between Karuma Falls and Murchison Falls in the Murchison Falls National Park is the steepest section of the entire Nile and provided the biggest challenges. The Adrift team were charged eight times by large crocodiles, drifted through pools holding hundreds of hippos and were watched over on one portage by a pride of lions. In over 20 years of rafting worldwide, for the Adrift guides, this river is the ultimate challenge. However, today Adrift have diversified into much 'softer' options to cater for the wide range of tourists the country now attracts. The company cater for rafters from ages 2-72 years and there is certainly no pre-requisite regarding swimming. 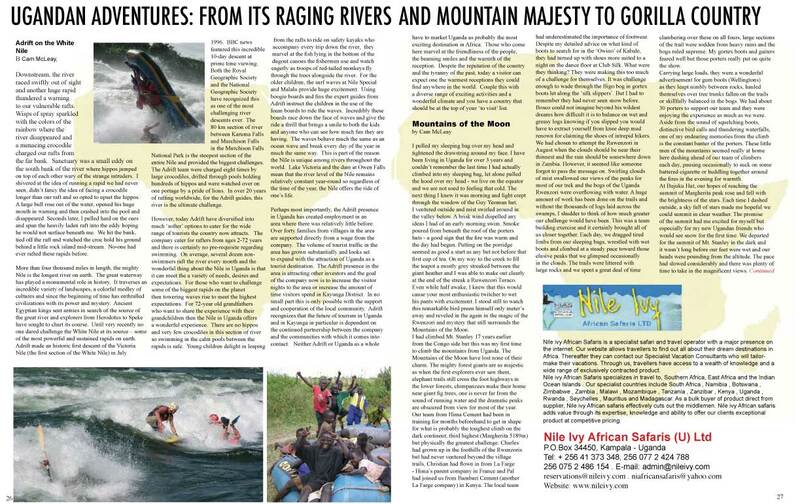 On average, several dozen non-swimmers raft the river every month and the wonderful thing about the Nile in Uganda is that it can meet the a variety of needs, desires and expectations. For those who want to challenge some of the biggest rapids on the planet then towering waves rise to meet the highest expectations. For 72-year old grandfathers who want to share the experience with their grandchildren then the Nile in Uganda offers a wonderful experience. There are no hippos and very few crocodiles in this section of river so swimming in the calm pools between the rapids is safe. Young children delight in leaping from the rafts to ride on safety kayaks who accompany every trip down the river, they marvel at the fish lying in the bottom of the dugout canoes the fishermen use and watch eagerly as troops of red-tailed monkeys fly through the trees alongside the river. For the older children, the surf waves at Nile Special and Malalu provide huge excitement. Using boogie boards and fins the expert guides from Adrift instruct the children in the use of the foam boards to ride the waves. Incredibly these boards race down the face of waves and give the ride a thrill that brings a smile to both the kids and anyone who can see how much fun they are having. The waves behave much the same as an ocean wave and break every day of the year in much the same way. This is part of the reason the Nile is unique among rivers throughout the world. Lake Victoria and the dam at Owen Falls mean that the river level of the Nile remains relatively constant year-round so regardless of the time of the year, the Nile offers the ride of one's life. Perhaps most importantly, the Adrift presence in Uganda has created employment in an area where there was relatively little before. Over forty families from villages in the area are supported directly from a wage from the company. The volume of tourist traffic in the area has grown substantially and looks set to expand with the attraction of Uganda as a tourist destination. The Adrift presence in the area is attracting other investors and the goal of the company now is to increase the visitor nights to the area or increase the amount of time visitors spend in Kayunga District. In no small part this is only possible with the support and cooperation of the local community. Adrift recognizes that the future of tourism in Uganda and in Kayunga in particular is dependent on the continued partnership between the company and the communities with which it comes into contact. Neither Adrift or Uganda as a whole have to market Uganda as probably the most exciting destination in Africa. Those who come here marvel at the friendliness of the people, the beaming smiles and the warmth of the reception. Despite the reputation of the country and the tyranny of the past, today a visitor can expect one the warmest receptions they could find anywhere in the world. Couple this with a diverse range of exciting activities and a wonderful climate and you have a country that should be at the top of your 'to visit' list. I pulled my sleeping bag over my head and tightened the drawstring around my face. I have been living in Uganda for over 3 years and couldn't remember the last time I had actually climbed into my sleeping bag, let alone pulled the hood over my head - we live on the equator and we are not used to feeling that cold. The next thing I knew it was morning and light crept through the window of the Guy Yeoman hut. I ventured outside and mist swirled around in the valley below. A brisk wind dispelled any ideas I had of an early morning swim. Smoke poured from beneath the roof of the porters huts - a good sign that the fire was warm and the day had begun. Putting on the porridge seemed as good a start as any but not before that first cup of tea. On my way to the creek to fill the teapot a mostly grey streaked between the giant heather and I was able to make out clearly at the end of the streak a Ruwenzori Turaco. Even while half awake, I knew that this would cause your most enthusiastic twitcher to wet his pants with excitement. I stood still to watch this remarkable bird preen himself only meter's away and reveled in the again in the magic of the Rwenzori and mystery that still surrounds the Mountains of the Moon. I had climbed Mt. Stanley 17 years earlier from the Congo side but this was my first time to climb the mountains from Uganda. The Mountains of the Moon have lost none of their charm. The mighty forest giants are as majestic as when the first explorers ever saw them, elephant trails still cross the foot highways in the lower forests, chimpanzees make their home near giant fig trees, one is never far from the sound of running water and the dramatic peaks are obscured from view for most of the year. Our team from Hima Cement had been in training for months beforehand to get in shape for what is probably the toughest climb on the dark continent; third highest (Margherita 5189m) but physically the greatest challenge. Charles had grown up in the foothills of the Rwenzoris but had never ventured beyond the village trails, Christian had flown in from La Farge - Hima's parent company in France and Pal had joined us from Bamburi Cement (another La Farge company) in Kenya. The local team had underestimated the importance of footwear. Despite my detailed advice on what kind of boots to search for in the 'Owino' of Kabale, they had turned up with shoes more suited to a night on the dance floor at Club Silk. What were they thinking? They were making this too much of a challenge for themselves. It was challenge enough to wade through the Bigo bog in gortex boots let along the 'silk slippers'. But I had to remember they had never seen snow before. Bosco could not imagine beyond his wildest dreams how difficult it is to balance on wet and greasy logs knowing if you slipped you would have to extract yourself from knee deep mud renown for claiming the shoes of intrepid hikers. We had chosen to attempt the Ruwenzori in August when the clouds should be near their thinnest and the rain should be somewhere down in Zambia. However, it seemed like someone forgot to pass the message on. Swirling clouds of mist swallowed our views of the peaks for most of our trek and the bogs of the Uganda Rwenzori were overflowing with water. A huge amount of work has been done on the trails and without the thousands of logs laid across the swamps, I shudder to think of how much greater our challenge would have been. This was a team building exercise and it certainly brought all of us closer together. Each day, we dragged tired limbs from our sleeping bags, wrestled with wet boots and climbed at a steady pace toward those elusive peaks that we glimpsed occasionally in the clouds. The trails were littered with large rocks and we spent a great deal of time clambering over these on all fours, large sections of the trail were sodden from heavy rains and the bogs ruled supreme. My gortex boots and gaiters feared well but those porters really put on quite the show. At Bujuku Hut, our hopes of reaching the summit of Margherita peak rose and fell with the brightness of the stars. Each time I dashed outside, a sky full of stars made me hopeful we could summit in clear weather. The promise of the summit had me excited for myself but especially for my new Ugandan friends who would see snow for the first time. We departed for the summit of Mt. Stanley in the dark and it wasn't long before our feet were wet and our heads were pounding from the altitude. The pace had slowed considerably and there was plenty of time to take in the magnificent views down the mountainside to Lake Bujuku. A fresh dusting of snow had settled into the wet moss and ice cold streams trickled beneath the giant groundsells. I had forgotten the simple pleasure of filling my mouth with fresh snow crystals and gazing down on the clouds from above. One foot up, balance, then place the next. My breathing was becoming shorter and my steps closer. I always feel that a large part of the magic of the mountains is that my mind wanders, I wonder what lies behind that large cloud or over the next ridge ..
Nile ivy African Safaris is a specialist safari and travel operator with a major presence on the internet. Our website allows travellers to find out all about their dream destinations in Africa. Thereafter they can contact our Specialist Vacation Consultants who will tailor-make their vacations. Through us, travellers have access to a wealth of knowledge and a wide range of exclusively contracted product. Nile ivy African Safaris specializes in travel to, Southern Africa, East Africa and the Indian Ocean Islands . Our specialist countries include South Africa , Namibia , Botswana , Zimbabwe , Zambia , Malawi , Mozambique , Tanzania , Zanzibar , Kenya , Uganda , Rwanda , Seychelles , Mauritius and Madagascar. As a bulk buyer of product direct from supplier, Nile ivy African safaris effectively cuts out the middlemen. Nile ivy African safaris adds value through its expertise, knowledge and ability to offer our clients exceptional product at competitive pricing.